Global Journal of Engineering Design and Technology (GJEDT) is an open access journal that operates with a single-blind peer review policy. It publishes original contributions that have a high likelihood of shaping the application and direction of Engineering Design and Technology. The journal’s content is of primary interest to scholars, other fellow researchers, industrialists and academicians. The journal launched in 2009. It does not have an impact factor yet and it is not indexed in PubMed/Medline at the moment. Indexing will be requested very soon. Global Journal of Engineering Design and Technology focuses on different areas, including Recent Trends in Technology, Green Computing, Grid Networking, Image and Multimedia applications, Industrial applications of neural networks, Information and data security, , Software Engineering, Emerging paradigms, Advanced Computing Architectures, Artificial Intelligence, Broadband and intelligent networks, Broadband wireless technologies, Multimedia Communications, Natural Language Processing, Network management and services, Pattern Recognition, System security and security technologies Design strategies, Usability and adaptability, Material, component and systems performance, Process control, Data Mining, Data Retrieval, Database Management System, Decision Support System, Security Systems and Technologies, Security, Privacy and Trust, Service oriented middleware, Collaborative applications, Communication architectures, Communication systems, Computational Intelligence, Computer Vision, Computer-based information systems, Computing Ethics, Cryptography. 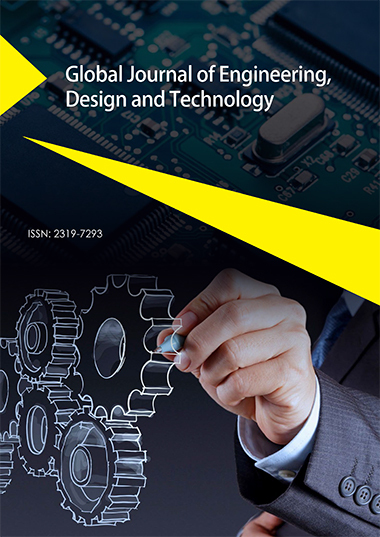 Global Journal of Engineering Design and Technology (GJEDT) is indexed by SJIF, CiteFactor, Index Copernicus and CROSSREF. Requests for permission to reproduce figures, tables or portions of articles originally published in Global Journal of Engineering Design and Technology can be obtained via the Editorial Office. Manuscripts submitted to Global Journal of Engineering Design and Technology should not contain material previously published in other publications, except as an abstract, and must not be currently under consideration for publication in another journal. Redundant publication is publication of a paper that overlaps substantially with one already published. When submitting a paper, authors should make a full statement to the editor about all submissions and previous reports that might be regarded as redundant publication of the same or similar work. Global Journal of Engineering Design and Technology considers research and publication misconduct to be a serious breach of ethics, and will take such actions as necessary to address such misconduct. Authors should refer to the Committee on Publication Ethics (COPE). Statements, opinions and results of studies published in Global Journal of Engineering Design and Technology are those of the authors and do not reflect the policy or position of the journal. Global Journal of Engineering Design and Technology provides no warranty as to the articles' accuracy or reliability.